Order Ritchies Steriliser & Cleaner 250g from the Stirling Homebrew Shop UK. 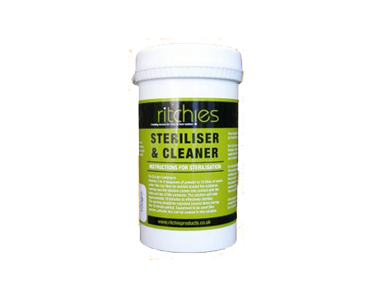 Buy Ritchies Steriliser & Cleaner Powder 250g and other Homebrew Chemicals safely online in the UK. Use steriliser powder, also known as sterilizing powder, for cleaning and sterilizing all your homebrew equipment. This is important to prevent bacteria build up and spoiling of beer and wine. Use steriliser powder, also known as sterilizing powder, for cleaning and sterilizing all your homebrew equipment. This is important to prevent bacteria build up and spoiling of beer and wine. Can also be used for kettles, stainless cups, dishwashers, pans and cutlery. Always read the label before use! Where to buy Ritchies Steriliser & Cleaner 250g safely online? Shop at the Stirling Homebrew Shop if you are wondering where you can buy Ritchies Steriliser & Cleaner Powder 250g safely online in the United Kingdom. Steriliser & Cleaner 250g - Ritchies Steriliser & Cleaner Powder 250g in Homebrew Chemicals and Homebrew.